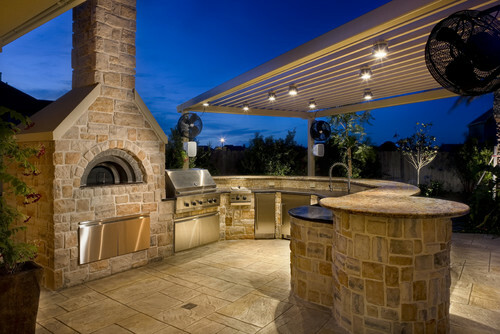 The popularity of outdoor kitchens is on the rise! Especially in cities like Scottsdale and Fountain Hills in Arizona where the weather is gorgeous 9 months out of the year. Think about it. Who wants to be inside cooking away while everyone else is outside enjoying the beautiful weather and sipping on a refreshing beverage? 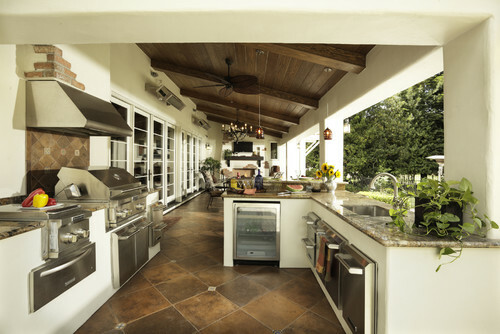 Here are some inspiring ideas to help get you started on your outdoor kitchen, so you can extend your living and outdoor space to suit your lifestyle.  As you look through the ideas, spend some time thinking about what you want, need and what actually makes sense for your space and budget. 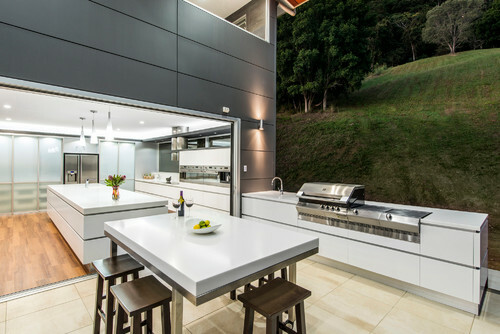 The stone countertops and even the cabinetry is mirrored from the inside kitchen to make this a sleek and modern take on the traditional concept of outdoor cooking. Notice the giant opening which is likely a set of large glass concertina doors that disappear on itself to create the ultimate in-out feel. This might be a difficult concept to pull off in areas such as the east coast, but in Scottsdale Arizona, where there is sun 300 days of the year and very few flying insects to contend with, you will wonder why you’ve lived without it for so long. Here, a popular patio layout is easily transformed to include all you need, from an outdoor grill, to a fridge and even a wash up station. A good reminder is that even though you are cooking outside, you need to pay attention to where your grill is able to vent away excess cooking smoke. In this instance, a hood above the cooking area was needed because of the way the ceiling sits. Everyone likes the look of stone, which is a timeless design for outdoor areas such as this stone bar area. A stone bar wouldn’t be a bar without an area where friends can sit and enjoy the company of the grillmaster while they sip their Napa Valley Cabernet. 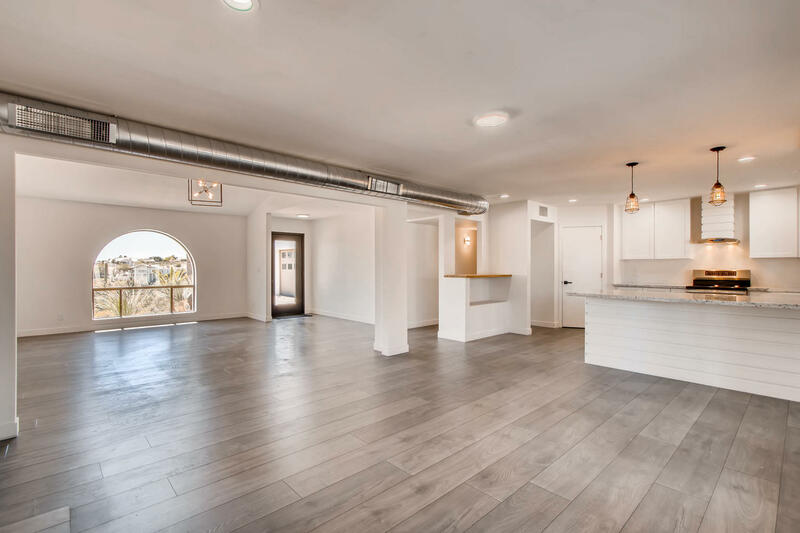 What makes this open concept a particularly great idea, is the inclusion of an old classic, a large brick pizza oven. Of course, pizza is not the only thing you can use it for as it has become quite a popular feature for our door chefs around the world, chasing that authentic taste of rustic cooking. 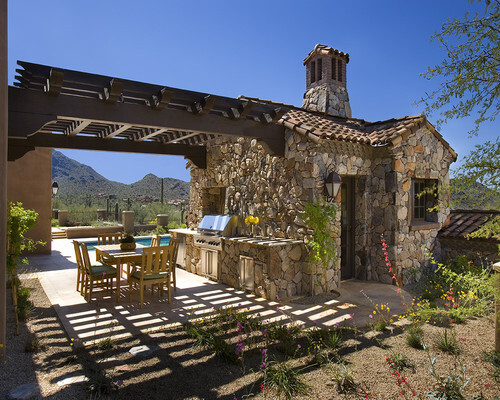 See how well this outdoor kitchen blends into the landscape and up against a stone wall? 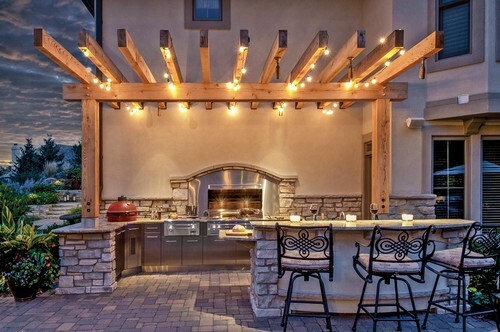 Well, many outdoor kitchens start with just that, a wall or area you can attach a counter and grill to. In this example, you have a large eating and mingling area right next to the grill, with a semi-shaded cover to keep the heat of the sun at bay. There you have it, some ideas to inspire your next outdoor project. Something that the whole family can enjoy almost every day, and one that would make you the most popular host with your guests. Sometimes a little thinking outside of the box is required to pull off a great outdoor area, but in any case you now have some fantastic ideas to creating an outdoor kitchen that will extend your living and entertaining space substantially and be a talking point with your friends and guests.